We design all of our courses to provide for the safety of the participants as well as with an eye to detail and long term use. Most of our unique designs are patented. All of our designs, with proper maintenance, will allow for tree growth without impediment for 5-7 years. We also account for long term (more than 10 years) for our designs with minimal changes and replacements necessary due to aging and tree growth. All of our designs exceed the standards set by the ACCT. 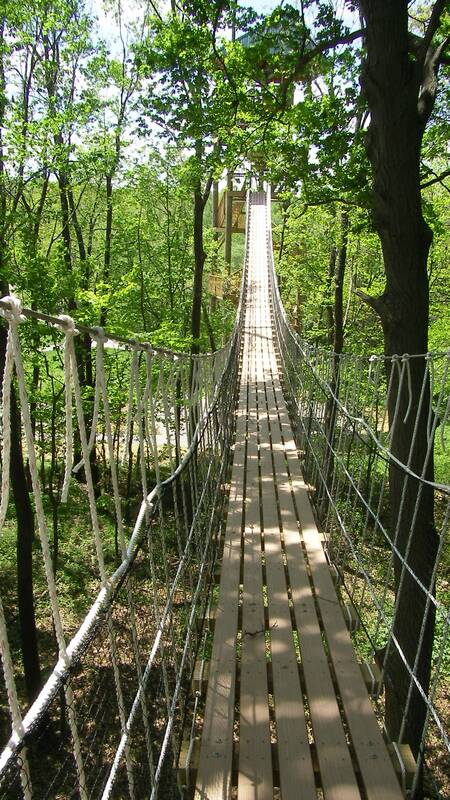 Our layouts will match zip lines, bridges and platforms to your program goals and the natural features of your site. Our platform structures have the fewest tree intrusions in the industry and mechanically allow room for the tree to grow without repetitive injury. This allows the tree to continue its natural growth while providing participants an up close interaction with a healthy forest. Our platforms are built in manageable pieces for easy installation and efficient transportation. These sections can be moved to remote areas on foot to eliminate the need for large equipment in sensitive areas. Our entire Canopy Tour process can be completed on foot which means less impact and a quicker recovery for the area’s ecosystem. This allows us to safely build in delicate ecosystems and in remote areas, allowing for a more unique participant experience. In order to shorten design time our platform system can be easily adapted to a wide range of trees. The design also simplifies installation to a few hours. This versatility extends to allow for the clients choice of decking materials, such as native woods, treated lumber, or synthetic decking. Our platform structures are built to greatly exceed ACCT standards making them stronger and more stable than equivalent products. We understand that every program is different and we can adapt our structures to accommodate the load requirements of your program. We can provide Engineer Stamped drawings to show compliance with any local or other applicable standards as needed. In short, our system reduces environmental impact and lessens cost and time of installation while providing a superior product. We have overcome the challenges of creating an unobtrusive automatic yet comfortable brake system for big zips. This system provides a graduated stop and catches the participant, keeping them at the landing zone. This system is unlike the hard jolt and aggressive stop experienced on some other brake systems. All of these functions are automatic, reducing operator error which is the leading cause of injury in the industry. By providing a stable trolley with various attachment points it allows us to vary zipping positions, including head first “Super Hero” style.